The Auroville Beach is located right off the ECR (East Coast Road), opposite the road leading to Auroville but not easily accessible. 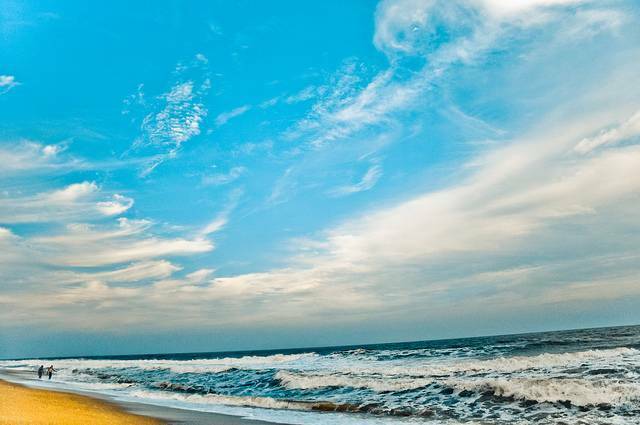 Located around 12 KMs from the main Pondicherry or Pudducherry town, its small waves make it an ideal place of swimming when compared to some other beaches in Pondicherry. As the name suggests, this beach is not inside Auroville or even near it. Its named so because of the Auroville bus stop near the beach. Auroville is about 7 kilometers from the beach. You will find few stalls on the beach selling some snacks and freshly fried fish. But on the other side you can not spend too much time on this beach as it is not that big especially when the tide is approaching. Lately some trash has accumulated on the beach and it is not as clean as it used to be. Soorya Beach Resort and a guest house by Auroville are some of the stay accommodations on this beach. Its not easy to reach this beach. After parking you car near the beach one has to go through a very narrow passage surrounded by dense vegetation.